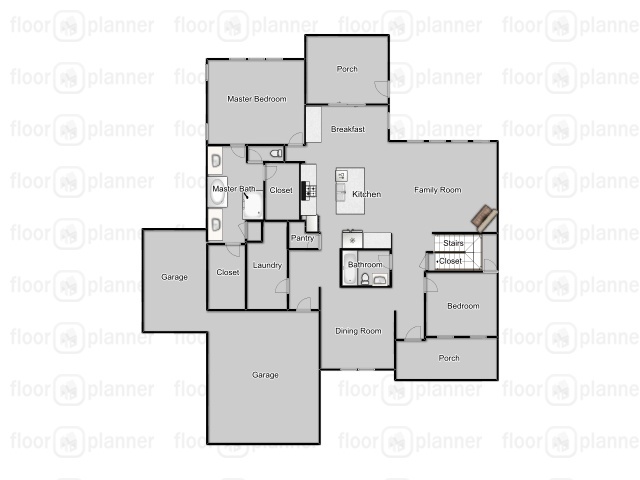 I tried out floorplanner.com to create some rough mark ups of our new house floor plan to share with y'all. 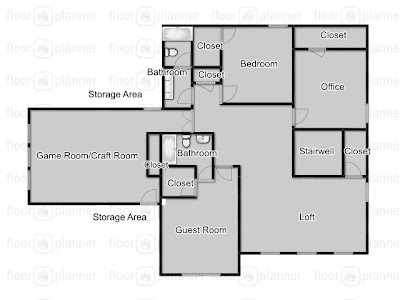 We thought a long time (and learned a ton from our first house) and looked at a bunch of floor plans before we landed on what would work best for us long-term. We are super happy with the layout. Floorplanner had some hiccups and took awhile to get the walls and other things to work so again these are not exact but as best as I could get. From my post on the house list you can see that we have the master and one other bedroom on the first floor and then 3 bedrooms on the second floor. While the must have was only 4 bedrooms, getting 5 allowed us to use one of them for Eric's office instead of his (or my office/craft room) being in an open area like the loft. It's going to be a great layout for whenever we have a bigger family regarding options of bedrooms down and up. We have a nice mudroom area outside the laundry room (directly across from the entry door) with a built-in containing shelves and hooks. I really like all of the closet and storage space we have too. While it doesn't have a deck (yet) it does have a big screened porch and we have plans to build a deck off of that in the future. All of our previous outdoor furniture is currently crammed onto the screened porch so we haven't really been using it yet other than to use the grill. My very favorite thing about the floor plan is the open kitchen and family room area. I love that big area and the amazing island. I also really enjoy looking out the kitchen and family room at all the trees we have in the backyard. Can't wait to do a home tour soon with tons of pictures! So exciting! I love an open kitchen and family room! And a screened-in porch and mudroom?! You guys are going to love it! !